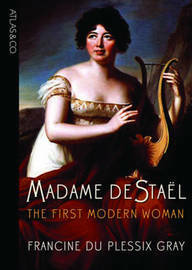 Madame de Stael was born into a world of political and intellectual prominence, as the daughter of Louis XVI's Minister of Finances, Jacques Necker. Later she married Sweden's ambassador to the French court and, for more than 20 years, held the limelight as philosopher, political figure and prolific writer. She was, however, more than just a mind. Despite a plain appearance, she was notoriously seductive and enjoyed whirlwind affairs with some of the leading intellectuals of her time - she was a true force of nature.